Oil and gas exploration isn’t limited to hospitable sites near big cities. It’s more likely your business will face harsh conditions like a desert or remote area without access to technology. Even though the terrain is rugged, you still have IT needs that meet all industry regulations and requirements. The solution is a prefabricated data center built to meet the needs of the environment where your team is working. Building a traditional data center can be costly and time consuming. In the oil and gas industry, it’s understood that cost constraints are one of the biggest concerns when meeting the needs of today’s businesses. Then there may other regulations that your organization will be subject to, like environmental concerns and privacy issues. A prefabricated data center addresses these problems while still providing predictability, flexibility, and speed. A prefabricated data center comes in module format, containing power, cooling elements, and IT products that can be reconfigured as your business needs change. Each section is carefully constructed to exact ISO specifications in a factory, then transported to your site as one unit. 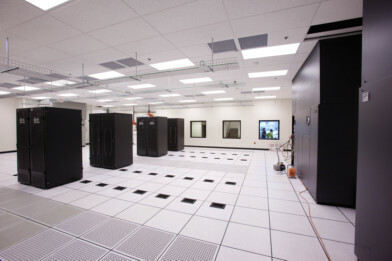 Your prefabricated data center is designed to fit what your organization needs it to do. When you place your unit in the environment it will be housed, specific architecture is provided to protect your unit against the elements. Instead of using components from multiple vendors and piecing together parts to make up your infrastructure, the prefabricated data center comes ready to go. The time frame to implement the unit is reduced by about 60 percent. Not only does this help your organization get started quicker, it keeps your maintenance costs lower because all the parts come from the same place and there are no compatibility or non-compatibility issues when using different components. This system is more predictable and reliable than a greenfield deployment or brownfield expansion. The oil and gas industry has benefited from technology as much as any other industry. It’s let businesses reach areas and find natural resources in parts of the world never before imagined. Take the next step with your business and save money on your IT infrastructure when you implement a prefabricated data center to keep up with the way you do business. Stop wasting time and your own resources to get the technology you want to simplify your management of the IT needed in the field.